Research from Kumamoto University, Japan finds that a natural compound isolated from onions, onionin A (ONA), has several anti-cancer properties for ovarian cancer. This discovery is a result of research on the effects of ONA on a preclinical model of epithelial ovarian cancer (EOC) both in vivo and in vitro. This research comes from the same group that found ONA suppressed pro-tumor activation of host myeloid cells. According to a 2014 review of cancer medicines from the World Health Organization, EOC is the most common type of ovarian cancer and has a five-year survival rate of approximately 40 percent. It has a relatively low lifetime risk that is less than 1 percent, but that can increase up to 40 percent if there is a family history of the disease. A majority of patients (80 percent) experience a relapse after their initial treatment with chemotherapy; therefore, a more effective line of treatment is needed. Kumamoto University researchers found that ONA has several effects on EOC. 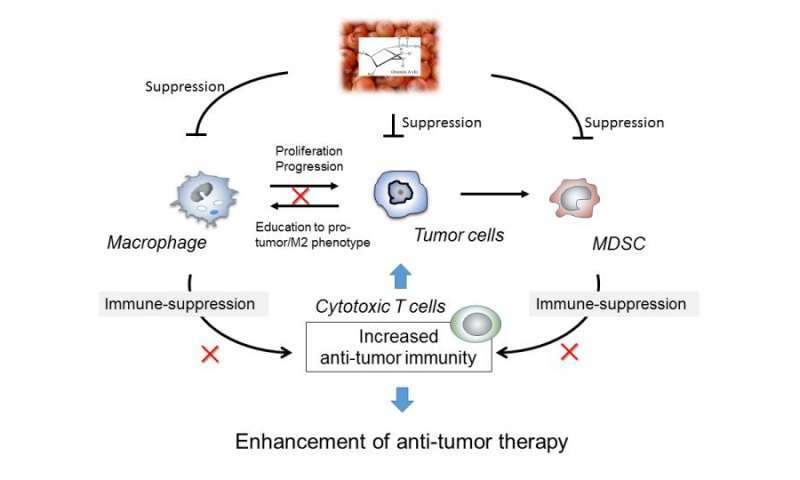 The group's in vitro experiments showed that EOCs, which usually proliferate in the presence of pro-tumor M2 macrophages, showed inhibited growth after introduction of ONA. This was thought to be due to ONA influence on STAT3, a transcription factor known to be involved in both M2 polarization and cancer cell proliferation. Furthermore, the team found that ONA inhibited the pro-tumor functions of myeloid-derived suppressor cells (MDSC), which are associated with the suppression of the anti-tumor immune response of host lymphocytes, by using preclinical sarcoma model. ONA was also found to enhance the effects of anti-cancer drugs by strengthening their anti-proliferation capabilities. Moreover, experiments on an ovarian cancer murine model that investigated the effects of orally administered ONA resulted in longer lifespans and inhibited ovarian cancer tumor development. This was considered to be a result of ONA's suppression of M2 polarized macrophages. The research shows that ONA reduces the progression of malignant ovarian cancer tumors by interfering with the pro-tumor function of myeloid cells. ONA appears to activate anti-tumor immune responses by nullifying the immunosuppressive function of myeloid cells. ONA has the potential to enhance existing anti-cancer drugs while also having little to no cytotoxic effects on normal cells. Additionally, no side effects in animals have been observed. With a little more testing, an oral ONA supplement could greatly benefit cancer patients.